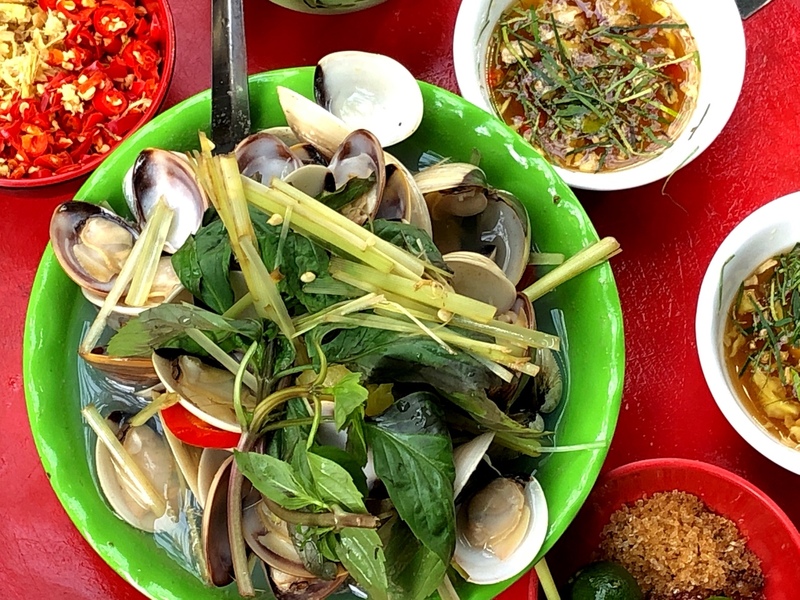 Exquisite cuisine in a humble setting: clams with lemongrass and herbs, at Oc Nong Ha Trang, in the Old Quarter. When I first visited Hanoi, in 1995, “street food” referred to something one bought from roving vendors. In the morning, outside our hotel, a woman wearing a traditional conical hat and ao ba ba (what we call pajamas) passed by carrying a cauldron of hot soup suspended from a bamboo pole. If you wanted a portion, she would plop down a tiny plastic stool for you to sit on while she served you in one of the bowls that she also carried. As I shared this memory with Sơn, my teacher during a recent street food class at the Hanoi Cooking Centre, he laughed. “That was the original street food,” he said. Then, starting in about 2005, as some people in this still very poor country became more prosperous, they opened small restaurants and food stalls. And gradually, Hanoi became a city of foodies who frequent the establishments that line almost every block. It’s still customary to sit on those little plastic stools elevated only about ten inches from the ground. But today there might be a table to go with them, also made of plastic, or sometimes topped with stainless steel. Locals, who over the years traded bicycles for motorbikes as the primary mode of transportation, now travel through choking pollution to eat at a favorite stall. Tourists, too, are more widely embracing street food, once considered the province of backpackers and adventurous independent travelers. Now there are food tours that usher around visitors who are afraid of getting lost, a mobile food app that you can use to find particular foods (and in some cases order them delivered) and cooking classes like the one I attended, to help travelers replicate some of their new favorites once they get home. The latter is nearly impossible, of course. Though some Asian ingredients are available in the United States in local Asian markets or even on Amazon – fish sauce, chilis and galangal (a root in the ginger family) come to mind – the many varieties of limes, coriander, mint, basil and other herbs are not. It’s a rare street food order that doesn’t come with a heaping plate of fresh greens that one can stir into soups to intensify the flavor, or dip into sauces between bites of the main event. 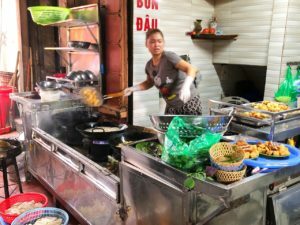 Another thing that makes street food unique is the manner in which it is prepared – outside, without regard to the damage that high temperatures, grease and charcoal might cause to the kitchen. So those pork rolls, skewered on bamboo sticks or sprigs of lemongrass and cooked on a tiny charcoal grill, really do taste different. As Asian food enthusiasts, my husband and I can’t get enough of all this, which is why on our latest visit to Hanoi, we stayed longer than most tourists – a total of ten nights punctuated by a Ha Long Bay cruise – to allow plenty of time for our favorite pursuit. It consists of prowling the city for stalls selling various foods and following the crowds to the ones that seem most popular with locals. Then, with a list of questions based on what we’d eaten and seen, we signed up for a street food cooking class to unravel a few mysteries and improve upon our own techniques. Some friends back home were incredulous when they heard our plans. “Aren’t you afraid of getting sick?” they asked. The short answer is that this is less likely in a food stall, which typically serves just one item prepared from the freshest ingredients, than it is at a fancy hotel or restaurant with a wide-ranging menu. A stall with a reputation for making its regular customers ill won’t survive in this competitive environment. Our time in Hanoi turned into a culinary extravaganza, and cost a fraction of our total food bill during a week back home. Though we sometimes relied on recommendations, some of our best eats were those we discovered just by walking around, observing the food up close and inhaling the smells. During our time there we based ourselves at two different hotels. One was in the Old Quarter, where there was street food right outside our door. The other was in the more tranquil French Quarter, where we were just two blocks from Hoàn Kiếm Lake, a site for early-morning and evening strollers and tai chi practitioners. Washing soup bones on the streets of Hanoi. 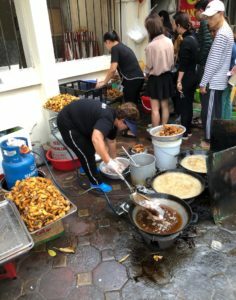 Wandering is the best way to observe street food being prepared: the old woman fanning the flames on a charcoal fire, for example, or another hosing down an enormous metal pot of soup bones, positioning them to strain into the gutter. Sights like these are one of the benefits of exploring by foot, but Hanoi is unfortunately not a pedestrian-friendly city. Sidewalks, where they exist, are often given over to motorbike parking. Traffic lights, where they exist, are ignored with impunity. There isn’t much in the way of public transportation. The noise, chaos and poor air quality can at times be overwhelming. When we needed a break from the strain of just getting across the street in one piece, we relied on the Asian ride-sharing service Grab to whisk us back to our hotel, or in some cases more distant parts of the city. As with Uber and Lyft, which do not operate in Hanoi, one summons them with an app. We rarely waited more than five minutes for these pickups, and the fare averaged about $1.50. So seductive was the street food here that, with the first mouthful, we would temporarily forget the obstacles of reaching our destination. Here are some of our favorite places, arranged according to the food they serve. Beef Noodle Soup at Phố 10 Lý Quốc Sư in Hanoi. A young Vietnamese man who wanted to practice his English with me once ridiculed a traditional American breakfast. “I don’t know how you can eat those soggy things floating in milk,” he said, referring to cornflakes. His preference was a bowl of beef noodle soup, or pho bo. This nutritious brew, made primarily of beef bones, is served not only for breakfast, but also for lunch, dinner and as a late-night antidote for hangovers. Though available all over the country, pho bo is said to have been invented in Hanoi and its environs. Ask ten people in this frenzied city how to make the perfect pho bo, and you are likely to get that many variations on the theme. 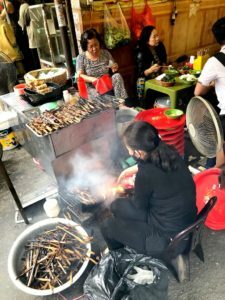 One area of agreement is that it is extremely labor-intensive, and therefore better (and more economically) consumed as street food than at home. The process begins by roasting the beef bones (they can come from any part of the animal) in a little oil at a high temperature (about 400 degrees Fahrenheit) for 20 minutes, and then rinsing them to remove impurities. After that, the bones are covered with water and simmered for eight hours. Meanwhile, but especially during the first two hours, as we learned in cooking class, fat, scum and other impurities should be skimmed from the top. Six hours into the process, one adds the essential spices. A star anise, whole cardamom pod and a piece of cassia bark (or cinnamon stick) should first be dry-roasted in a frying pan until fragrant. For the whole unpeeled shallots and galangal a different process applies: char-grill for five minutes until they are fragrant, then rinse to remove the blackened part, cool slightly and flake off the thin outer skin. Delighted to learn these techniques, we now needed a new tool to implement them: a small stainless steel grill basket for charring the spices. On the street we had seen these used over wood fires or hot coals. In class the teacher put the grill basket right over the gas stove. Sure, we could find one of these on Amazon, but why not take one home from Asia? After class we went directly to the Chau Long market, just five minutes from the Hanoi Cooking Centre, situated in the Ba Dinh District, and purchased one for 30,000 đồng, or VND ($1.30). It weighs practically nothing and packs flat. While in Hanoi, though, we were happy to leave the pho bo preparation to others. Of the many bowls of beef noodle soup that we consumed during our time there, the most memorable was at Pho Bo Ly Béo, at 4 Hang Nón, in the Old Quarter. The evening that we ate there we were staying just a couple of blocks away, at the Hanoi L’Heritage Centre Hotel, 14 Luong Van Can. When pressed to reveal where she ate pho bo, one of the staff there sent us to this stand, which sets up on the sidewalk in front of the VietinBank after it shutters for the night. The pho was aromatic, clear as it should be, and accompanied by a heaping bowl of fresh herbs (50,000 VND, or $2.16). And we were the only Westerners eating there. Though the soup at Phố 10 Lý Quốc Sư was a close runner-up (60,0000 VND, or $2.60), and the tables and chairs far more comfortable, it isn’t served with a plate of greens – just a few slices of chives and green onions floating on the top. On the two occasions we ate there, the apathetic staff, in orange polo shirts emblazoned with the restaurant name, seated us with other Westerners. (Two frequent visitors to the city had recommended the place to us.) This made for some interesting conversations comparing travel notes, but felt like a much less authentic experience. 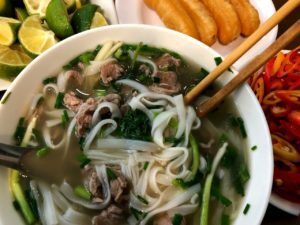 A popular accompaniment to pho bo is a plate of the puffy fat breadsticks (also known as Chinese donuts) called quẩy, which cost 8,000 or 10,000 (about 35 or 45 cents) extra. They’re greasy, but delicious, dunked in the soup – that is, unless you gobble them up before the soup arrives at the table. It’s a rare street food that doesn’t come with a heaping plate of fresh greens, like these served at Bun Cha 46 Phat Loc. Many Americans became aware of this Hanoi specialty after Barack Obama ate bun cha with Anthony Bourdain in a 2016 episode of “Parts Unknown.” Bun cha, we learn from the show, is barbecued pork prepared two ways: minced, combined with shallots and garlic and formed into rolls, and separate slices of pork cooked on the same grill. Both are served with a dip, prepared with sugar, rice vinegar and fish sauce, and garnished with slices of green papaya. One adds chilis, minced ginger and fresh herbs to taste. An enormous plate of rice vermicelli noodles accompanies the bun cha. The location of the legendary rendezvous, between the celebrity chef and the president, was Bun Cha Huong Lien. At the time, it was situated on a major thoroughfare in the French Quarter near a number of large hotels, including the Hanoi Hilton, the Sofitel Legend Metropole and the Hotel de l’Opera, where we stayed during part of our visit to Hanoi. Though hardly the bed that Washington slept in, the table where the two slurped noodles together was subsequently encased in glass, and the restaurant became a destination for foreign visitors. 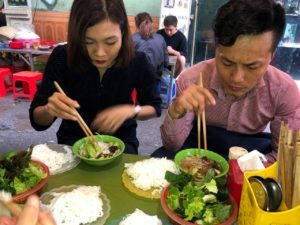 As tourists flocked there, locals began to call it “Obama Bun Cha,” and hotel concierges struggled in vain to persuade guests that there are many other excellent places to eat bun cha in Hanoi. Fortunately, I had already sampled a fabulous one that I discovered myself when I tracked down the site of the famous meal. I got there to find that the place had closed about six weeks earlier (according to a merchant next door), and that the restaurant had reopened at 59 Lang Ha, down alley number 14, in the Ba Dinh District. The cab ride there took roughly 20 minutes and cost about $3.50, none of which I minded, because I assumed it would be worth the journey. Only it wasn’t. Though the sauce and the pork rolls were flavorful enough, the other pork was tough and tasteless. I contrasted this concoction, prepared in a kitchen that I couldn’t see, with the heavenly bun cha I had eaten at lunchtime the previous day at 46 Phat Loc Street in the Old Quarter. There the pork rolls had been wrapped in betel leaves before being barbecued in a brassier on the street. They were crunchy and delicious. Tender slices of roast pork and crispy skin accompanied them. The couple who shared our table told us that they eat regularly at 46 Phat Loc. In contrast, at least half the customers at what’s popularly known as Obama Bun Cha seemed to be tourists. True to this name, the place is decorated with photos from Obama’s visit, and there’s a menu item called “Combo Obama”: bun cha, a fried seafood roll and a bottle of Hanoi beer. It also happens to be the only street food stall that I ate at in Hanoi where orders were taken on an iPad. Wherever you eat bun cha, the going rate is 35,000 or 40,000 VND per serving (about $1.50 or $1.75). A side order of fried spring rolls, which is a popular accompaniment, will run you another 30,000 or 40,000 ($1.30 or $1.75). The only thing served at Chả Cá Lã Vọng is the restaurant’s signature dish: marinated cat fish that diners finish cooking at the table. This famous Hanoi fish dish isn’t street food per se, but originated at a dive that has morphed into a high- priced tourist destination. That restaurant is Chả Cá Lã Vọng, situated at No. 14, on what used to be called Hang Ca but is now called Chả Cá Street in its honor. To reach the place, one enters a building in the Old Quarter that looks like a shop-house, and climbs a rickety flight of narrow wooden stairs almost as steep as a ladder. There is no menu – the only thing served is the restaurant’s signature dish, which arrives swiftly after one sits down. It consists of local catfish that has been cubed, marinated in turmeric and other spices, and cooked in oil. It’s brought to the table hot in a frying pan and placed on an oil burner. The server unceremoniously dumps in a bowl of sliced spring onions and dill, and leaves diners to do the rest: Stir with chopsticks until the vegetables wilt, and turn off the burner before the whole concoction overcooks. It’s eaten over rice noodles, with a sprinkling of fish sauce and a scattering of peanuts. At 170,000 VND ($7.36) per person for a culinary experience that lasts about 45 minutes from start to finish (including waiting for the food), this is a delicious rip-off by Hanoi standards. No wonder most Vietnamese choose to eat their chả cá elsewhere. On the last night of Tet – the Vietnamese New Year – we wandered into Vua Chả Cá, a chain with six branches in Hanoi, and became part of the festivities. For about the same price as a portion at Chả Cá Lã Vọng, a serving there was twice the size and enough to feed both of us. 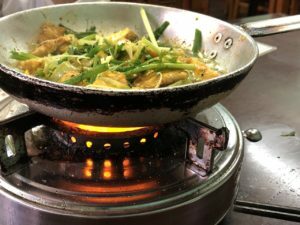 Compared to Chả Cá Lã Vọng, the restaurant, at 26c Trần Hưng Đạo, seemed sterile, with an induction burner on the table. The chả cá wasn’t quite as tasty, but as the revelers at the next table nodded approvingly at our dexterity with chopsticks and raised their beer bottles to wish us an auspicious new year, the good cheer certainly made up for it. By far our most memorable fish meal in Hanoi was neither of these, but a lunch eaten on the street. We were on our way from our hotel to the Temple of Literature by foot late on a weekday morning when I saw a long line bisecting the sidewalk near 30 Nguyén Thai Hoc. “I don’t know what that is, but count me in,” I said, taking my place at the end of the line. There, over a propane burner, a cook with great dexterity and flair was frying and refrying massive quantities of fish in several giant woks. While my husband found a place for us at one of the small plastic tables set up along the sidewalk, I took my cues from the locals at Bun Cá Hanh Béo: Hold up a finger to indicate the number of portions, pay 30,000 VND ($1.30) apiece. Then carry to your table the allotted portion of crisply fried fish and a bowl of dipping sauce that the server hands you. What we didn’t realize was that this also entitled us to a large bowl of fish soup with rice noodles, but a group at the next table took care of that, motioning the server to bring us what we were due. After that, there was apparently no right or wrong way to consume this meal. One could eat the fish plain, dip it in the sauce or dunk it in the soup, slurping down noodles between bites. Eating snails at Oc Nong Ha Trang. If anyone minded the cacophony of the Friday afternoon rush hour at Oc Nong Ha Trang (1A Dinh Liet), the crowd gave no indication of it when we stumbled upon this stall in the Old Quarter. They were much too busy using fine-motor skills to extract snails and miniature clams from their shells. 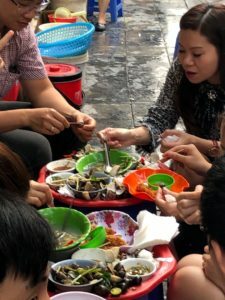 I promptly ordered a bowl of the latter (ngao hấp), which turned out to be a heaping pile of tiny clams, about the size of small littlenecks, served in a broth with dill leaves, slivers of pineapple and red chilis, and topped with julienned lemongrass stalks and a few stems of holy basil (70,000 VND, or about $3). Set atop a plastic tray, three smaller bowls accompanied this artfully arranged concoction. Our waiter, who spoke good English, explained the protocol. There was a bowl of fish sauce already seasoned with dill, ginger, lemongrass and chili. We could add more ginger and chilis from a second bowl, and from a third add a pinch of sugar and squeeze in the juice of young (green) kumquats, which, we learned, are commonly used as the citrus of choice when limes are out of season. We became enraptured with this Hanoi specialty, which starts with rectangular tofu tubes that are flash-fried and then cut with scissors into cubes. Before biting in, one dunks them in a sauce made of warm purple fermented shrimp paste (called mắm tôm), flavored to individual taste with chilis and unripe kumquats. Each bite is a delightful mélange of flavor and texture: The crunchy tofu exterior turns chewy, and the soft center dissolves on the tongue as you register sweet, hot and salty from the dipping sauce. A sliced fried fish cake may also be included on the plate. With all this routinely comes a generous helping of slippery, slithery, rice-noodle cakes and herbs. (“The Greens of Vietnam: A Guide to the Herbs in Vietnamese Food,” an article on the VietnaMenu website, was invaluable here and elsewhere to help us identify them.) That’s a good thing, because once you have seasoned the dipping sauce just so, you will want every excuse to keep consuming it. Our favorite stand for bun dau has no name, but it is situated at So 5 Ma May, in the Old Quarter. At lunchtime you can’t miss it: Tables for this establishment occupy half an alley (the designation “so” in an address refers to an alley) and wrap around the corner onto Ma May Street, where patrons vie for a spot to park their motorbikes on the sidewalk. As at so many street stalls where we were the only Westerners, customers sitting next to us helped us place our order. As they left, one of them informed us that our meal should cost 30,000 VND, or $1.30, per person. (There were no prices posted.) By the time we returned, a few days later, we practically felt like regulars. 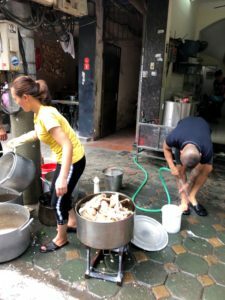 In the French Quarter, close to Hoan Kiem Lake and the large hotels, there’s an excellent bun dau stand that operates only on Saturday and Sunday afternoons. It’s on Tràng Tien Street, about half a block from the lake on the right-hand side, under the awning for the Thang Long Bookshop (which has an extensive collection of Vietnamese cookbooks, in English). Their presentation, on a bamboo platter lined with a banana leaf, is especially attractive (25,000 VND, or about $1). At Nyugen Ninh, the banh com display case doubles as a cash register. An article we spotted in the daily English-language newspaper Viet Nam News led us to the Nguyên Ninh store at 11 Hàng Than Street to buy their particular brand of this Hanoi delicacy. It’s a family-owned company that has operated since 1865. Like so many other foods we ate in this city, the sensory pleasure of bánh cốm derives from a combination of flavor and texture. Initially I had my doubts about this one, though, since it looks like something out of Dr. Seuss’s Green Eggs and Ham. The main ingredient is green sticky rice, which is formed into gelatinous cakes measuring about two inches square and one-quarter of an inch thick. Inside is a paste prepared with mung beans, lotus jam and grated coconut. They’re then wrapped in plastic and sold at storefronts up and down Hàng Than Street. But as we watched the motorcycles pull up in front of No. 11, we knew we had come to the preferred source. It was mid-morning, and customers were snapping up these cakes, which sell for 5,000 VND (22 cents) by the dozen, under the watchful eye of the family ancestors, whose portraits adorn the walls. We bought three – each is packaged in a green-and-red box with Nguyên Ninh’s logo and looks like a Christmas present – not sure whether we would like them. Since the company does not use preservatives, we should be sure to consume it within three days, the salesman warned. (A tiny slip of paper inside each box reminds consumers of the freshness date.) No worries. Only by exercising great restraint did we make those three luscious treats last until late afternoon. Early the next morning (the store opens at 6:30 a.m.), we were back for more. We were departing that day, on a flight to the Imperial City of Hue. With the three-day freshness guideline in mind, we bought ten more bánh cốm. As it happens, we later saw piles of them, prominently displayed at the airport gift shops – though at a cost of 60 percent more than we had paid. Apparently we weren’t the only ones who wanted to take a few scrumptious bites of Hanoi with us. Deborah L. Jacobs is the author most recently of Four Seasons in a Day: Travel, Transitions and Letting Go of the Place We Call Home. Follow her on Twitter at @djworking and join her on Facebook here. You can subscribe to future blog posts by using the sign-up box on her website’s homepage.